APC, a Dublin-based firm that works with many of the world’s leading pharmaceutical companies, has announced a major expansion at its headquarters as it looks to more than double headcount in the next few years. The pharmaceutical research company, which designs, develops and markets proprietary engineering platform technologies, is to open a 30,000sq ft specialist research and development (R&D) unit at its Cherrywood facility in Dublin next month. This is part of a move to broaden its capabilities in biological and synthetic molecules. “The cumulative size of the facility will allow for a headcount of about 250 people. The investment is part of a five-year plan that will seriously allow us to scale,” Dr Mark Barrett, APC chief executive and co-founder told The Irish Times. He was speaking on the sidelines of the EY Ireland Entrepreneur of the Year CEO Retreat, which is taking place in San Francisco this week. 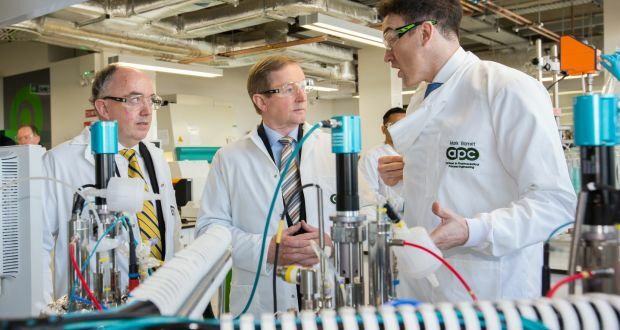 APC was established by Prof Brian Glennon and Dr Barrett as a spin-out from UCD’s school of chemical and bioprocess engineering in 2011. The company has developed two engineering platform technologies, ACHIEVE and BioACHIEVE, for troubleshooting research and manufacturing issues and improving the design of chemical and biopharmaceutical compounds. APC works with eight of the world’s top 10 pharmaceutical companies and half of the leading biotech firms. Early last year, the company opened new headquarters in Cherrywood Business Park in a move that led to the creation of 100 highly-skilled research and development jobs across chemical engineering, sciences and analytics. Dr Barrett said the new jobs will all be high-end roles for specialists with PhDs with postdoctoral experience. The company derives about half of its revenues from the US with a further 30 per cent from mainland Europe and 15 percent from the Republic. It has experienced fast growth with revenues increasing from €100,000 in year one to €3 million in 2013. “This year we’ll have grown by about 60 to 70 percent to around €20 million and are looking to ultimately push past €50 million in 2018/2019,” said Dr Barrett. APC was previously shortlisted for The Irish Times Innovation Awards, while Dr Barrett is among the finalists for this year’s EY Entrepreneur of the Year awards.